Executive director Michael Walton speaks during a regional workshop Wednesday, May 4, 2016 at green/spaces. Keynote speaker Frank Rapley speaks during a regional workshop Wednesday, May 4, 2016 at green/spaces. Where does air leak in and out? At age 76, Glenda Whelcher still mows her own yard, tends her flowers and tries to watch out for her neighbors along her Stuart Street home in East Chattanooga. At a community gathering with some of her neighbors earlier this year organized by the environmental group green/spaces, she picked up some valuable tips and devices to help her also get better control of her costly winter heating bills. "By taking some simple steps and using what they gave me, I've been able to save a lot of money," Whelcher said. Her monthly electric bill dropped from more than $200 to only $67 after she made the energy improvements recommended as a part of green/ spaces' Empower Chattanooga. "That program really helped me a lot," she said Wednesday outside of her home in East Chattanooga. It's also helping others who live around Whelcher because she is using some of those energy savings to buy more gas for her car to help provide needed transportation for her neighbors. "I was not only happy to see how much I saved on my power bill, but I knew that with this blessing I wanted to help others," she said. Whelcher's experience has sparked a new fundraising appeal by green/spaces to promote its energy efficiency campaign in Chattanooga's low-income neighborhoods where both residential power usage and requests for United Way assistance in paying those bills are the highest. Empower Chattanooga has targeted East Chattanooga, Highland Park and East Lake to provide $8 kits with energy saving devices and lights, as well as help with identifying simple ways to reduce monthly utility bills. Empower Chattanooga, which started last year with funding from the Lyndhurst, Footprint and Benwood foundations, has already assisted more than 1,000 people with low-cost and no-cost ways to reduce utility bills and is looking to raise more money to expand the campaign by encouraging program recipients to use part of their savings like Whelcher did to "Save It Forward." Michael Walton, executive director of green/spaces, said his group is challenging all Chattanoogans to participate in the "Save It Forward" campaign to educate more homeowners and renters like Whelcher. "If utility bills are high, less money is available for other necessities, like gas for a car," he said during a workshop Wednesday among energy efficiency experts from across the country. "In many households, the money saved on utilities will ease tight budgets for families that currently are forced to make trade-offs between healthy food, home payments, utilities and health care." Office Furniture Warehouse (OFW) is the first business to partner with the Save it Forward campaign. "We want to see an unfortunate cycle broken, and for these communities to regain control of their expenses, retain disposable income, and improve the quality of life within," OFW owner John Jerman said. The energy savings ideas have been spread by green/spaces volunteers and staff in the targeted communities through dozens of movie nights, community dinners and neighborhood cleanup events. "Empower is not just about energy efficiency," said Dawn Hjelseth, director of development for green/spaces. "It's about building the community holistically. The community events allow people to meet their neighbors and to start to get to know one another, as well as to give us a chance to introduce ourselves and invite people to our Basic Energy Workshops." Empower Chattanooga is part of Chattanooga's efforts to reduce overall energy consumption. The city and UTC have also committed this year to cutting energy consumption by at least 20 percent in the next 20 years. EPB has conducted 2,951 free eScore energy audits to help residential customers identify ways to trim their energy use. The city utility also is preparing to install two community solar arrays that, combined, will generate 1.35 megawatts of renewable power. Chattanooga Mayor Andy Berke said such efforts are helping to not only improve the city's natural environment, the mayor said such improvements have helped the city recruit new industry and improved the appeal of Chattanooga to visitors, workers and entrepreneurs. Chattanooga was labeled by the federal government in 1969 as the dirtiest city in America because of its air pollution. Berke said after cleaning up its air the city is now enjoying above-average economic gains and below-average unemployment. "Does anyone think that what has happened here would have occurred without cleaning up our air and our city?" Berke asked. "No one is going to invest in the dirtiest city in America." 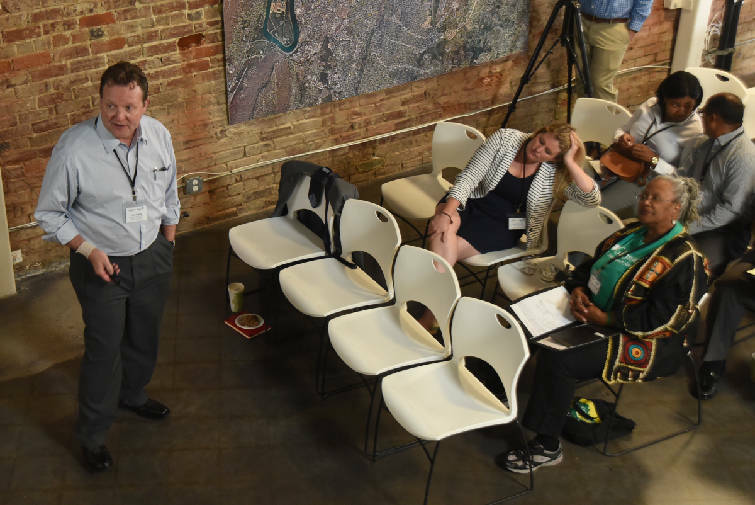 Chattanooga is one of 50 communities participating in a national competition for a $5 million energy savings prize organized by Georgetown University. So far, Chattanooga has reduced electricity consumption by nearly 30 million kilowatt-hours, saving more than $1.03 million in energy costs and reducing carbon emissions by nearly 10 million kilograms. Chattanooga currently ranks 31st among the participating cities, but organizers say all communities should benefit from the program. "Whether your city comes in first or not and whether or not you win our prize, we're all winners because all cities are seeing significant savings and all of America is enjoying the reduction in carbon emissions," said Francis Slakely, founder and director of the Georgetown University Energy Prize. Collectively, Slakely said the participating cities have saved more than $55 million in energy costs and cut more than 50,000 tons of carbon emissions over the past year and a half. Frank Rapley, general manager of energy efficiency for the Tennessee Valley Authority, said new technologies for smart meters and controls, along with solar, wind and other distributed energy sources, are revamping the energy market. "The world is changing dramatically and we at TVA — and all of us — must adapt," he said.